Who does not know Kung Fu Panda? Po, the panda, has become everybody’s idol. 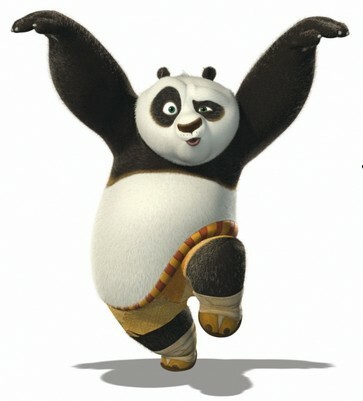 What I have learnt from Kung Fu Panda is — There is no secret (to success). Singapore students should have received their SA1 results by now. A student of mine said she is number 3 in class. I am happy for her. After a while, she said it has regressed, she was number 1 in class last year. I told her that learning become harder every year, so she should work harder. After I went home, I thought about what I have said. Maybe I should not ask her to work harder. She is a brilliant primary student; I believe she has worked hard. I should have told her not to take the number in class too seriously. No wonder foreigners think that studying in Singapore is very tension, very pressure and very demanding! Tai Lung, the villain, was a natural kung fu fighter. But he was not satisfied, he wanted to become the best and was looking for the Dragon scroll that was believed to have the secret to the best kung fu skill ever. So, deaths, injuries and destruction happened just because of one scroll. After all the fighting, Tai Lung found out that the scroll was empty! You can imagine how disappointed he was. Yes, there is no secret to success. Things become special because people believe them to be special. Number 1 is thought to be the best you can get, but can you have number 1 in everything? in your entire life? If you have done your best, do not feel sad by “number 3”, you should be happy you are not number 4, or whatever number behind. I was number 1 in P1 and number 2 in P2. Guess what? My family members and friends thought that I would get number 3 in P3. I did not really care, just continued studying as usual, and I was number 2 in P3. If I were affected by what others have said, maybe it would become worse, because I was too tensed up to focus on study. Anyway, when I went to secondary and tertiary, I dropped to whatever number behind, which I could not remember, because more people were joining in the competition, even foreigners. So, my dear little darling, I still hope that you will continue your hard work, but do not pressurize yourself with numbers. It is just a number after all. By Wendy in Education and Study on 22/05/2013 .